February 12 2015. At the USATF Masters Cross Country Championships in Boulder CO this past Saturday, February 7th, there were some remarkable individual races. The race was run on the Flatirons course over 2 kilometer loops-3 for the Masters Women and 4 for the Masters Men. It was a gorgeous, if unexpectedly warm day for the open runners. But the temperatures in early morning for the Masters races were ideal for cross country, in the mid-40’s. That left only the altitude to cause problems for the runners. Overall. The primary favorites in the women’s race were 41 year old Melody Fairchild, a national champion many times over, and 50 year old Colleen DeReuck, a 4-time Olympian. Fairchild was the Footlocker High School Cross Country champion and finished 3rd in the World Junior Cross Country Championships, an all American and national champion at Oregon, she later twice qualified for the Olympic trials. More recently she has excelled at Mountain running, joining the US National team, finishing 8th in the 2012 World Mountain Running Championships, helping the U.S. team to a gold medal. DeReuck is a 4-time Olympian and holder, until recently, of virtually every master’s road distance record from 5K to the Marathon. Originally from South Africa, she gained her U.S. citizenship in 2000 and competed for the USA in the 2004 Olympics in Athens, Greece after winning the US Olympic Marathon Trials. In 2014, Fairchild and DeReuck chased Nuta Olaru around the course with Fairchild coming up just short of the victory and DeReuck fading a bit toward the end to finish 18 seconds back. How would things go this time? DeReuck played the main strategy card available to her, going out hard and trying to hold it as long as she could. Would Fairchild let her get away and if so, would she be able to close? The answer to the first question was yes, as Fairchild started at a measured pace and let DeReuck break away. By the end of the second lap it was clear that DeReuck had opened a big lead for Fairchild to close in just 2 kilometers. But then Fairchild found another gear and started to accelerate and close the gap. But was it soon enough? No—Fairchild ran out of course real estate before she could catch DeReuck. So it was a very special win for DeReuck, in her first year as a 50+ athlete. Fairchild was deeply disappointed, but had a very creditable 2nd place finish, just 3 seconds behind at the finish. And she had the pleasure of leading her team, Boulder Mountain Warriors, to victory. For the first two loops, it was a real battle for third between the Warriors’ 2nd runner, Maureen Wrenn and DeReuck’s teammate, Joanna Zeiger. In the early going, Zeiger was hanging onto Fairchild with Wrenn a bit off their pace. But by the end of the race, Wrenn had a comfortable lead over Zeiger and the third spot on the podium. One other Masters athlete should be mentioned who ran at Boulder on the 7th. Four time Olympian, Jen Rhines, ran in the Open race and actually finished 3rd, qualifying for the USA Cross Country team that will compete in the World Cross Country Championships in China next month. Because she ran in the Open race she is not eligible for any Masters awards. Jen Rhines, #687, keeps pace with Mattie Suver, #698, as she surges past Brianne Nelson to stay in contention for a podium finish and a spot on the USA team going to the 2015 World Cross Country Championships at the USA Cross Country Championships in Boulder CO on Feb 7 2015. But it is worth reporting that Rhines covered the 8K course (4 loops) in 28:21 which works out to 3:32.6 per kilometer compared to the winning time of 22:26 over a 6K (3 loop) course which works out to 3:44.3 per kilometer. Rhines is in that golden age that the best runners can enjoy for a few years; she is still fast enough to compete in the Open Elite class but she is eligible to break Masters records, which she did last fall in the 10K at Tufts in Medford MA. Making Team USA at the age of 40 along with one of her twenty-something BAA teammates must be sweet indeed! 40-44. Not surprisingly the overall lead group had the 2nd, 3rd, and 4th overall finishers on the 40-44 podium, Fairchild, Wrenn, and Zeiger. a 19 second victory. It was over a minute back to the third finisher, Kathleen Cushing-Murray of the famed running Cushing-Murray family of Southern California. 50-54. Colleen DeReuck was, of course, the overwhelming favorite and took the age group crown along with the overall Masters Championship. But there was quite a list of competitors behind her vying for the other two podium positions. Four Colorado runners, Laura Bruess and Dianne Gates of Boulder, Noelle Green from Erie, and Janet Rooney, from Louisville, were prepared to do battle for 2nd and 3rd. Last year Bruess and Rooney finished 2nd and 3rd to Sheila Geere who is not competing this year. Green competed in the W45 division but moved up this year; her time was just a little faster than Bruess’s last year. Gates is a newcomer to the USA Cross Country championships but her sub-40 time in the Bolder Boulder 10K suggests she has the talent to contend. Gates was able to get out fast and establish a gap over Greene, with Bruess and Rooney not far behind. In the end Gates nailed second and thirty seconds back, Green hung tough to join DeReuck and Gates on the podium. not able to catch her. It ensured a strong run and a lot of space between her and the 3rd place finisher, Hart. It was also a close race for 3rd as Hart came in just 16 seconds ahead of Buttner, to claim her second consecutive year on the podium..
60-64. Everyone assumed that this class belonged to Freeport, New York's Kathy Martin, 9-times USATF's Masters Harrier of the Year, and they were absolutely right. As expected, Martin went out early, established a gap, and widened it a s the race went on. In the end she had a 6 minute gap on the 2nd place finisher, Boulder's Nancy Antos. It was a great race by Antos, however, as she clipped almost two minutes off her time from last year--what an improvement--inspiring! Lynne Kidder, also of Boulder and Antos's teammate on Revolution Running, ran a steady pace, bettering her 2014 time by a minute to take the 3rd spot on the podium. 65-69. Unliike some of the earlier races, this was very orderly. Laurie Rugenstein took 1st by 2 and a half minutes over Sandi Wiebe who, in turn, had a two and a half minute gap over the 3rd place finisher, Jean Nistico, all 3 of them local runners from Boulder. In one respect it was not orderly; Rugenstein actually competed for the B team of Boulder Road Runners, coming in ahead of two A teamers--food for thought for the Road Runner organizers! Nistico took the crown last year but even though she ran 16 seconds faster this year, had little chance against stronger competition. Rugenstein has run sparingly over the last few years but when she runs, she does well, especially in 10K road races. Wiebe is an active triathlete who races several times a year; that strength stood her in good stead in this cross country contest. 13 months later. At the finish line, it was Gonzales by 3 minutes. But Valent just hung on to beat Hunter by 3 seconds, one of the closest finishes of the day in determing 2nd and 3rd place on the podium! 75-79. This category belonged to Libby James, the remarkable record setter from Fort Collins CO. A member of the Colorado Running Hall of Fame and holder of three American records for her age group, in the 5K, 10K and half marathon, James wins just about every race she runs in and usually by several minutes. This race was no exception as she finished with over a 12 minute lead on her 2nd place finisher. Undaunted by the presence of such a famed competitor, Judith Smythe, also of the Boulder Road runners, chugged along to take 2nd place on the podium. Overall. Last year Greg Mitchell of McMinnville Oregon, ran a remarkably steady race, leading the pack through the first two loops of the course, establishing an 11 second gap over California's Rusty Snow, and holding that winning gap to the end of the race. And Oregon's Ahrlin Bauman and Colorado's Simon Gutierrez had an epic battle for third which Bauman won by a whisker. This year there was one pair of new legs in the person of Jacques Sallberg, who turned 40 recently and celebrated with a Masters win at the Fiesta Bowl Half Marathon in December with a time of 1:12:04.Once again, except for reeling in an early surge by Gutierrez, Mitchell led the pack around the early loops, with Sallberg back in about 5th or 6th place, biding his time. back. Sallberg was able to put in a surge that Mitchell could not answer as Sallberg hit the tape with a 15 second lead over Mitchell who had a bigger gap on the third place runner. Mitchell definitely answered the challenge, running 11 seconds faster than his 2014 winning time. But this time it was Sallberg's day. Gutierrez stole a page from DeReuck's strategy book from earlier in the day as he blasted out over the first part of the course to see if he could open a gap. Although he put some stress on the chase pack, Mitchell and company were able to reel him in. But it still had the desired effect, as Ahrlin Bauman was not able to catch him and Gutierrez rode his lead into the finish line, thirteen seconds faster than his 2014 time, to claim the third spot on the podium that he lost to Bauman in 2014. Ahrlin Bauman took the 4th spot and had the satisfaction of duplicating his victory over his brother Oscar, who finished in 6th. John Gardiner, of Cal Coast, kept pace as long as he could and wound up with a 5th place finish overall. 40-44. As usual, this group closely resembles the overall contest. The one exception is due to the fact that Gutierrez is the wily veteran of the overall group and competes in the 45-49 division. In this division it was Sallberg, Mitchell and A. Bauman. 45-49. Simon Gutierrez took this age group by a half minute. Rusty Snow, who dogged Greg Mitchell's footsteps all the way last year to a 2nd place overall, had to settle for an age group second place this year. Whether it was the heat, the altitude or the early fast pace, Snow fell back from the lead pack early and never fully recovered. Still, it was enough for a very nice 2nd place finish in the group. It was almost 45 seconds back to Paul Thompson, running unattached out of Peekskill NY., who made the podium in this age group for the second straight year. and then David Litoff, a Coloradan who finished 5th last year. In the end, Burdett's heroics won the day as he soared to victory in this division, winning by a 40 second margin over Barres who nailed 2nd place with 9 seconds to spare. Litoff did eventually close with and pass Magill but Magill was able to find the strength to stay with him. In the end, Magill had a kick that would not be denied as he took the final spot on the podium by 3 seconds over Litoff, who can be proud of a very game effort. gun and established a sizable gap over Pilcher. In the end it was not close as King pulled in with a comfortable age group win, 45 seconds ahead of Pilcher, who was, at the end, only 7 seconds ahead of the third place finisher, Spale. Pilcher definitely felt the altitude was a challenge. No doubt he will be looking forward to the 8K national championship closer to sea level in Brea CA on February 22nd to try to ink his first national championship of the season. 60-64. The winner from last year, Doug Bell, and the third and fourth place finishers, Bruce Wilkins and John Tarkowski were back. The only podium finisher not coming back was Tim McMullen, Wilkins's teammate from the Genesee Valley Harriers. But they would also have to contend with two newcomers to the age group, 60 year olds, Rick Becker from Selah WA, and John Victoria from Colorado Springs. 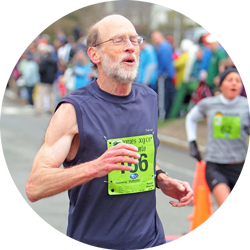 Becker finished 2nd to the great Tom McCormack in the .US National 12K road championship in November 2014 so would clearly be a force to be reckoned with. Victoria did not run much in 2014 but in 2013 he had three sub-19:00 5K's, all at altitude. Becker got out very strong, running mostly with runners a decade or two younger, and established a large gap quickly which he maintained throughout for a big win, coming in almost two minutes ahead of the 2nd place finisher. It was much closer for 2nd and 3rd. Doug Bell nearly claimed the 2nd place finish but, in the end, the younger legs of John Victoria were able to keep Bell at bay as he closed strongly for a 16 second margin of victory. An impressive performance from Becker. Both he and McCormack are entered in the Brea 8K championships on the 22nd of February. Who will take the rematch? That should be a race worth watching! Roeske a few strides back, Jimenez about 20 yards further back, and Katz further back, presumably having an off day. By the end of the second loop, Roeske had thrown in a surge and established a small gap over Hansen, who found he could not respond. In the meantime, Jimenez had, apparently closed the gap with Hansen a bit. When they got to the finish Rappole had a solid lead over Hansen with Jimenez closing fast; the fleet Californian's kick carried him right past Hansen, almost before the defending champion knew he was there. It should be quite a rematch at the USATF 8K championships in Brea next week, where both are also entered. 70-74. The second place finisher from last year, Tom Lemire of the Boulder Road runners was the only one from the 2014 podium to enter this year. Returning from a bit of a hiatus was Jan Frisby of Grand Junction, Colorado. Masters Runner of the Year for his age group three times in the 1990's and a fierce competitor throughout the following decades, Frisby suffered a serious injury that kept him away from championships for much of 2013 and nearly all of 2014. His comeback started with two races last year but then another setback. Would he be able to show the form that led to an age group championship at the Club Cross Country Championships in 2012 and the USA Cross Country championships in early 2013? We needn't have worried--Frisby was on form, and one of the most stylish runners on the course with his bright green knee-high socks. He beat last year's winning time by almost three minutes. Lemire hung in to take 2nd, and Ron Mastin of the Atlanta Track Club claimed the final spot on the podium. 75-79. Last year John Brennand and Charles Westley had the race to themselves but neither returned to defend their place in 2015. Instead there were three brand new challengers for the championship, Henry Kaplan, Colorado, David Turner, Georgia, and Thom Weddle of Minnesota. Although new to this championship, Turner won his age group at the USA National Club Cross Country championships in Bethlehem PA last December. And in the 2013 USA Cross Country Championships at St. Louis, Turner came in two minutes ahead of Weddle. So it looks like Turner vs. Kaplan with Weddle looking for the 3rd spot on the podium. In the event, Turner had all that he needed and more as he came in 4 minutes ahead of Kaplan, with Weddle claiming the third spot. 80-84. Last year Mike Fenerty, Verne Carlson and Donald Hayes, the Colorado trio repelled all comers as they cantered to victory---and they are back to try for a repeat. Another year, another podium finish for the trio. But this time, Carlson overtook Fenerty to reverse the first two spots. It was Fenerty by 37 seconds last year; this year Carlson took it in a cakewalk, winning by nearly 5 minutes.